China battered Mongolia in their third match of women's basketball at 2018 Asiad, by a heavy score of 110-36 here on Monday. China failed to show their dominance from the beginning as Mongolia took a lead of 8-2 with two three-pointers in the first two minutes. After Liu Jiacen and Li Yuan (170-PG-00) stood up and contributed five points, China came back to the game with better offence and less fouls, and build up a double-digit lead by the end of the first quarter. Since then, China didn't give their opponents too much chances to score, finishing the next two quarters by 31-9 and 26-9 respectively. Mongolia only scored one three-pointer in the last quarter. The 19-year-old Yueru Li (192-C-99) scored a team-high 21 points and Sijing Huang (192-F-96) contributed 16 points. Speaking of the tough situation they met at the beginning of the game, team leader Shao Ting thanked their head coach, saying "he (Xu Limin) called a timeout in order to calm us down and get well-prepared for Mongolia's unconventionally strategy, which was a good lesson for us." It's the third straight win for China's women basketball team at Asiad. Xu told Xinhua that players will try to perform to their best potential in every matches, no matter who their rivals are. "It's for the whole team's long-term benefits," Xu added. China will face Hong Kong, China on Thursday, their last game in women's basketball preliminary rounds. 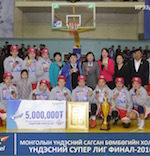 Darhan celebrate the title in Mongolia. 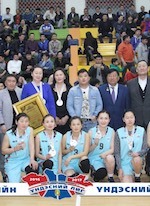 In the Final series they beat Arhangai 2-0 with the final 56-52 win. In Game 1 Darhan celebrated a 60-47 victory. They dominated the majority of the game and rightfully opened the Finals with the win. Last year UBTDS surprised the winner of the Regular Season Muis Oyutni and won the Final series 2-1. UBTDS surprised the winner of the Regular Season Muis Oyutni and won the Final series 2-1. UBTDS started the series with a 69-58 win, then lost 39-42 and won again wit the same result, 69-58 in Game 3. In the last game Solongo top-scored for the winners with 15 points, while Odoncecer posted 13. Ishtaaya nailed 12 points for the winners and Manhzul added 8. Onermaa replied with 13 points in the losing effort, whilst Nandinceceg posted 12.